I think his family would say that his desire to be at the Sunday morning services at the jail, topped anything else. Eventually, as his health started failing, he had to have a wheel chair to make it down the long hall leading to gym B. It meant so much tot he inmates that he would make that effort to worship with them that they would send him cards and want me to tell him that they were praying for him when ever he wasn't there. He was not able to stand by the exit and shake hands with the inmates after services so many of the inmates would step out of line to go shake his hand. The guards always looked the other way. God bless them for that. The last Sunday he was there, his son Bob brought him in a wheel chair. He was on high levels of oxygen and could only make it through 2 of the services. I think all of us knew it would be his last time there. His son, Ed Jr., recorded his last words for Berean volunteer's, "it's the Lord's work. to Him be the glory. We are just His workers." Our work day yesterday started with out the usual piles of mail. We only had one tub full and it seemed most of them were request letters instead of studies. That was a good thing, we were a little short of volunteers. Tim Martin was only able to bring a few boxes of unwrapped Bibles down from the warehouse, just enough to get us through that one day. 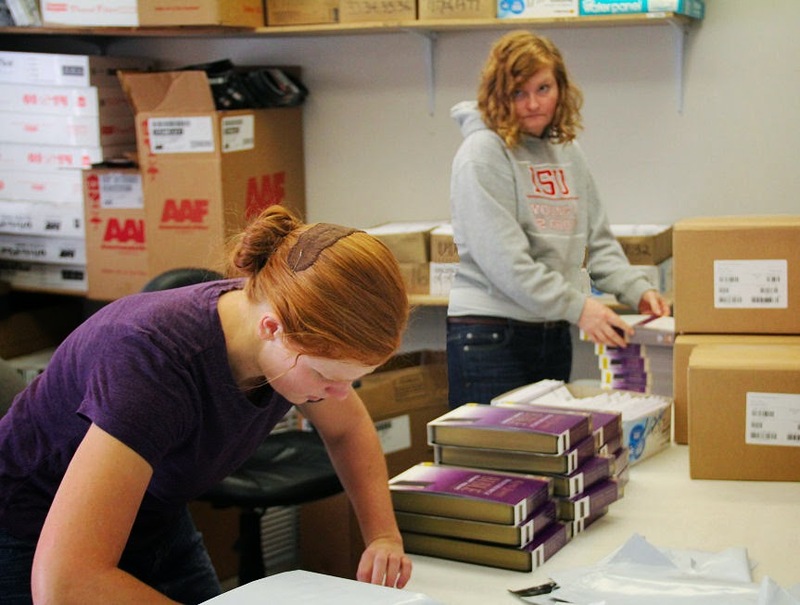 Below Rhoda and Emily were the willing workers stuffing and wrapping the Bibles. 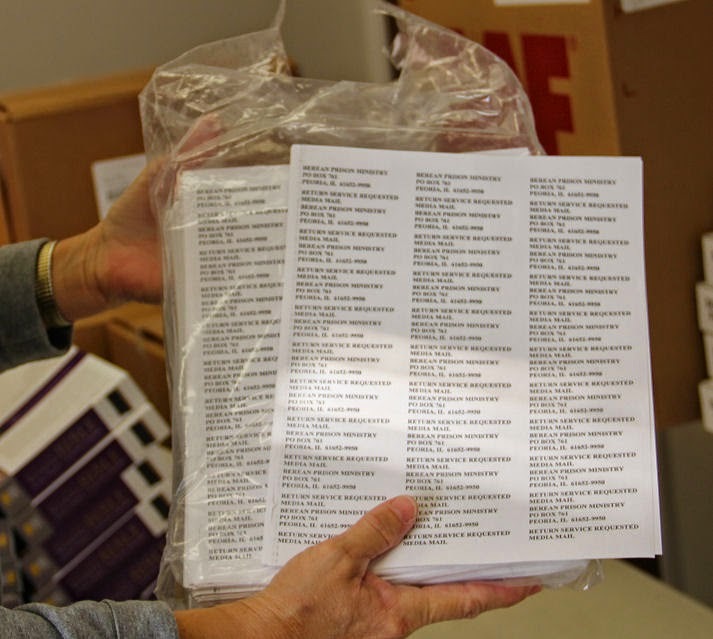 Last week Diane realized we were almost out of the return labels that must go on each of the Bibles and ordered 30,000 of them. 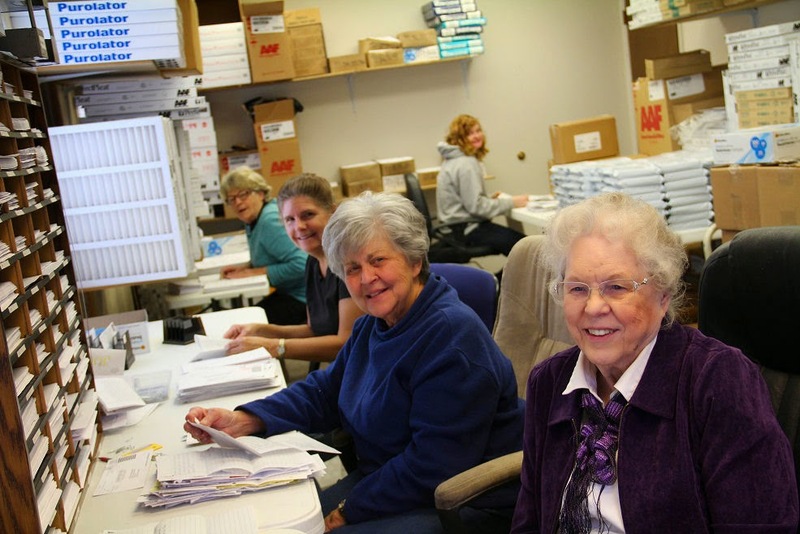 Thankfully they came just in time as we finished our last sheet so Emily and Rhoda were able to have the Bibles all ready just needing the name and address of who they would be mailed to as soon as the letters were processed. Once the studies were done, it took Emily and I a few hours to process all the letters. We were not able to finish labeling the Bibles before lunch. Below everyone is busy with a job to do either opening mail, reading letters or processing the studies. Hi my name is Teddy. My friend got a study Bible from yall and I was just praying to God for a way to study about my king. I would love to be come a precker ar consler and just wont to get closer to God. If posubul could send me a Bible with Big prent I don't got no way to pay but by prayer and asking God to bles you. Thank you and God bleas you. Sarry for my speeling your friend Teddy. We don't advertise our program at all, it is just word of mouth and has now grown to over 32,000 prisoners on the rolls! Why is Jesus Doing Time?